Immunity Boosting Drink... that actually tastes amazing! Immunity Boosting Drink… that actually tastes amazing! We all know there’s stuff we can add to our diets to boost our immunity in winter… right?! To be honest we’re sick of the blog posts ‘5 ways to boost your immunity’ and we’re not sure about all those magical health elixirs and tonics. We just don’t like those words to be honest (we like the word ‘drink’, simple and to the point). Anyway the amazing thing is that we’ve been enjoying this delicious drink (yes we said it is delicious) and it includes an abundance of stuff that’s good for boosting our immunity! Win win situation. 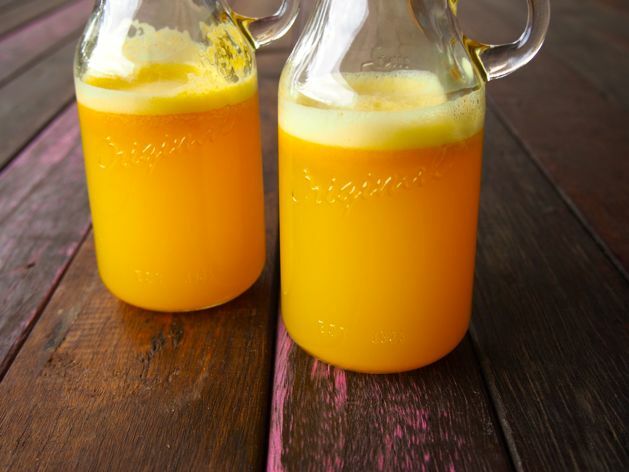 What’s in this immunity boosting drink… that actually tastes amazing… oh! And why is it good for us? Good questions! Ginger: reduces inflammation and congestion (anyone notice how warm ginger makes you feel?) and it’s a great source of antioxidants. It also aides digestion and detoxification. We LOVE ginger. Citrus: hello vitamin C! 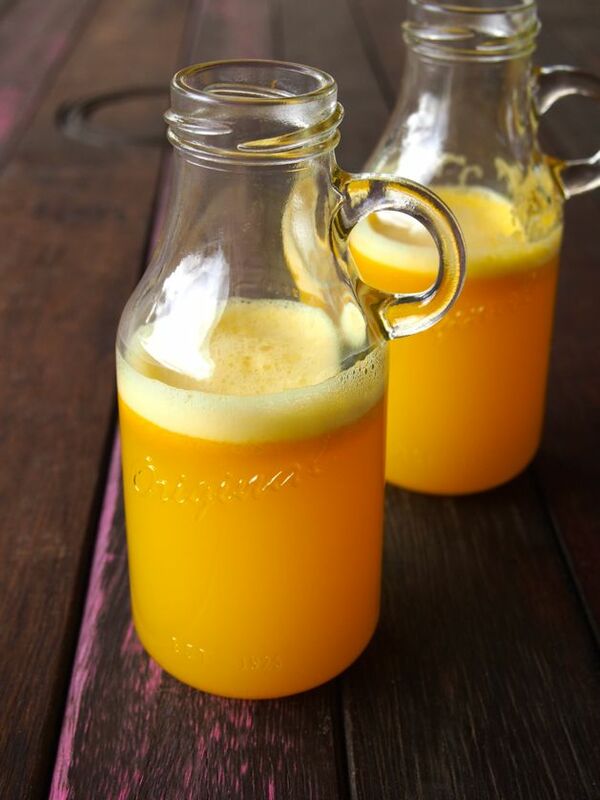 A great anti-inflammatory with heaps of antioxidants. Cinnamon: antiviral, antifungal, antibacterial and also freaking delicious! SO YUM! Definitely our fave spice (well, one of them). 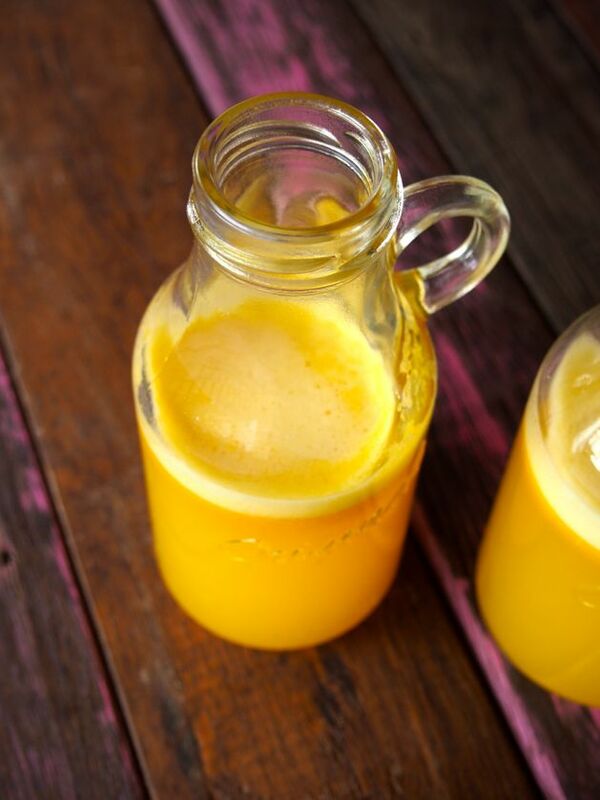 Turmeric: reduces inflammation, antiviral, antifungal, antibacterial, aids digestion, source of antioxidants. We have read you’re meant to consume turmeric along with fat (like oil/butter in cooking), but we still added it to our drink. Let us know your thoughts on this subject! Raw honey: we don’t eat a lot of honey due to the fructose content however it has awesome immunity boosting factors, like it’s antibacterial, antiviral and antifungal with heaps of antioxidants. Try and go for local raw honey when you can because this will help you fight local bugs and flus. All these ingredients make for one healthy drink! We reckon it’s the bubbles that make it extra delicious and fun (even the word bubbles is fun to say!). We can thank our brand new SodaStream Play for the bubbles (yes… it’s bright yellow and it is adorable… and it matches our immunity drink!). If you don’t know about SodaStreams (then you probably should!). They turn regular tap (we use filtered) water in to sparkling water in seconds, just by the push of a funky button! Simple fill, insert in to the SodaStream, push and WA-LAH! Sparkling water coming at ‘cha! Yay! We’ve spoken about our love of sparkling water before. It really helped us kick the diet coke habit way back when and you can also turn it into delicious healthy natural flavoured drinks. The SodaStream has also upped our awesome factor because it has reduced our recycling waste in epic ways (we spoke about plastic bottles last week… there was a time when our recycling bin was full of at least 30 sparkling water bottles every 2 weeks, eeeeeek, not good, sorry world… we promise we will make it up to you!). You don’t HAVE to make your Immunity Boosting Drink bubbly but as we said… it’s super fun and just plain awesome. We’re going to keep experimenting with new flavours and we’ll report back with our ideas! If you have some ideas of your own we’d really LOVE you to comment below and tell us all about them! OR if you make an Immunity Boosting Drink, share a pic on social media and tag #themerrymakersisters so we can check it out! Blend or mix all the ingredients except the sparkling water. Pour evenly in to 2 glasses and top with sparkling water! 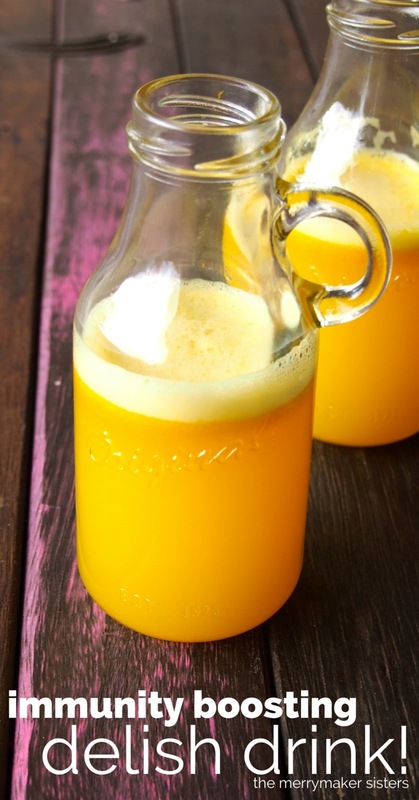 Adding bubbles to this delicious immunity boosting drink is super FUN! 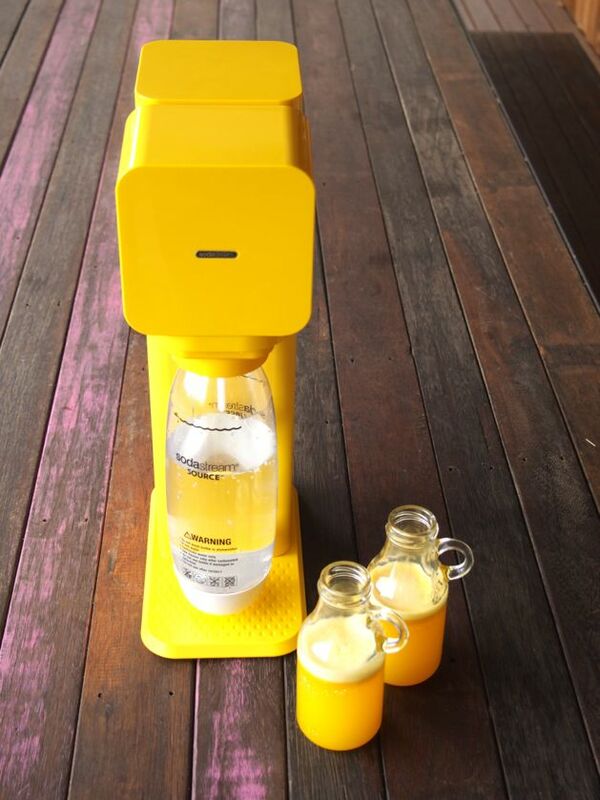 *Sending huge virtual hugs and high fives to our blog supporter SodaStream. We love our SodaStream and they love us (yay for love! )… so we collaborated on this post. Read more about this here.